Like other cruciferous vegetables, cabbage is rich in fiber, vitamin C and beta-carotene. 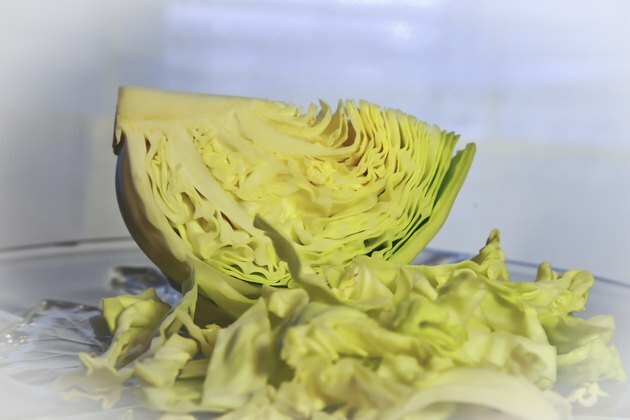 Unfortunately, boiling your cabbage may leach away some or all of these valuable nutrients, and cooking it in aluminum pots can cause it to release sulfurous compounds into your kitchen. 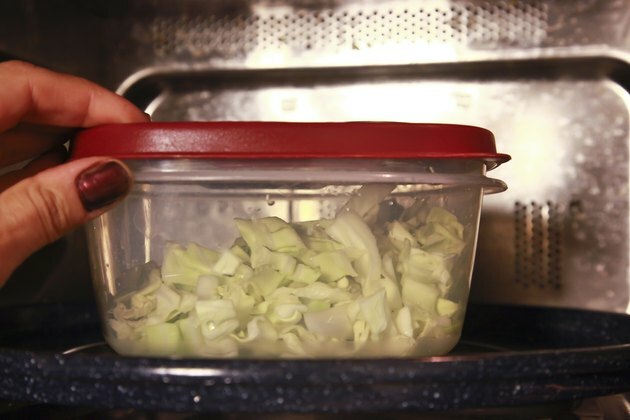 Microwaving your cabbage in non-metal containers helps to preserve its nutrients and prevents it from creating a smelly house. Microwaving also speeds up the cooking process, and you only have to add water to create a healthy side dish for any meal. Remove the tough outer leaves of the cabbage and discard them. Rinse your head of cabbage under running water to remove any dirt, debris or chemical residue from it, recommends the U.S. Food and Drug Administration. 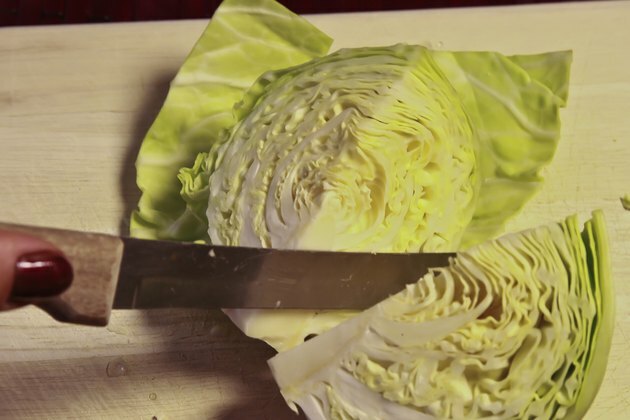 Cut the cabbage into wedges or remove the core of the cabbage and shred it by hand with a knife or in a food processor. 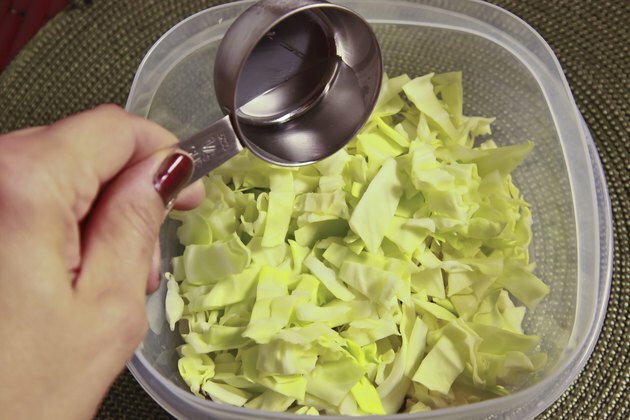 Place the cabbage into a microwave-safe container that can accommodate all of the cabbage you have. Add a small amount of water, no more than a few tablespoons, to the container. 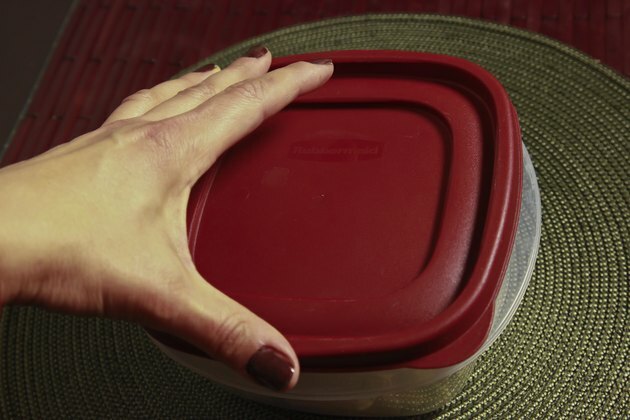 Cover the container with its lid or with plastic wrap; poke a hole in the wrap to vent it. Add salt, pepper or other seasonings to your cabbage either before or after the cooking process to add some flavor. Mix in a few spoonfuls of lemon juice or red wine vinegar to red cabbage before microwaving to help preserve its color when cooking it. It also adds a tangy flavor to your cabbage and won't add unnecessary fats or calories to it. Along with vinegar, also add some apple slices, raisins, cloves and a bit of sugar to your cabbage before microwaving it for a sweet-and-sour cabbage dish. 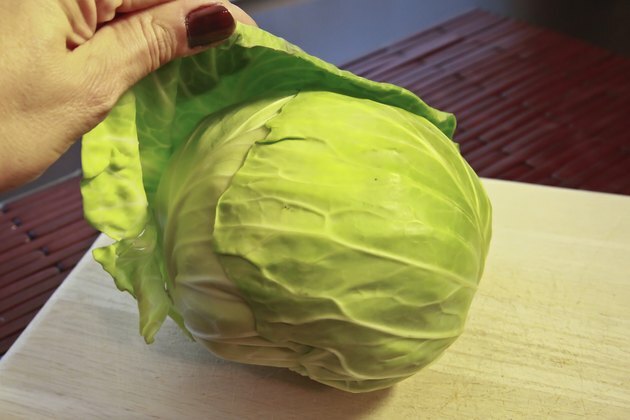 Store your cooked cabbage in the refrigerator, set to around 40 degrees Fahrenheit, for three to five days, or freeze it for up to a year in an air-tight container at 0 F.
When using plastic wrap to cover your cabbage, don't allow it to touch the cabbage. Doing so prevents any chemicals from being transferred to the cabbage from the plastic during the cooking process, recommends the Harvard Medical School Family Health Guide. Harvard Medical School Family Health Guide: Microwaving Food in Plastic: Dangerous or Not?